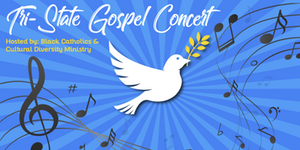 Choirs from the Archdiocese of Philadelphia, the Diocese of Wilmington and the Diocese of Camden will join to present a concert of gospel music on Sunday, Feb. 11, 2018 at the Gordon Theater of Rutgers University-Camden. The concert will be hosted by the Black Catholics and Cultural Diversity Ministry, with the sponsorship of the Rutgers University-Camden Office of Diversity and Inclusion. Doors will open at 2:00 p.m. and the performance will begin at 2:30 p.m. The concert is free. Tickets can be reserved online at https://www.eventbrite.com/e/tri-state-gospel-concert-tickets-41526587140. For additional information, contact James E. Andrews at (856) 583-2907 or Father Richard Owens, O.F.M. Cap. at (215) 587-3541, or visit www.facebook.com/NJBlackCatholics.